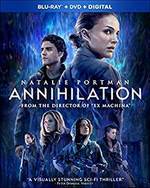 Biologist and former soldier Lena (Natalie Portman) is shocked when her missing husband (Oscar Isaac) comes home near death from a top-secret mission into The Shimmer, a mysterious quarantine zone no one has ever returned from. Now, Lena and her elite team must enter a beautiful, deadly world of mutated landscapes and creatures, to discover how to stop the growing phenomenon that threatens all life on Earth. Vitals: Director: Alex Garland. Stars: Natalie Portman, Oscar Isaac, Jennifer Jason Leigh, Gina Rodriguez, Tessa Thompson, Tuva Novotny. 2018, CC, MPAA rating: R, 115 min., Adventure, Box office gross: $32.696 million, Paramount. Blu-ray extras: Three-part featurette: Part 1 – Southern Reach: "Refractions": See how director Alex Garland created the tone, textures and color palettes for the various film environments on set; "For Those That Follow": the cast’s perspective on their roles and why they found the story so intriguing; Part 2 – Area X: "Shimmer": how filmmakers transformed real set locations to create the world of Annihilation; "Vanished into Havoc" mind-blowing stunts and special effects; Part 3 – To The Lighthouse: "Unfathomable Mind": why the visual effects are integral to achieving director Alex Garland’s overall vision for "Annihilation"; "The Last Phase": cast and crew share their fondest memories from filming "Annihilation." The Fourth Estate: Multi-part documentary series explores the process and progress of The New York Times and its journalists in covering the Trump administration. Produced and directed by Emmy Award-winning and Oscar-nominated filmmaker Liz Garbus. The Last Witness: An ambitious young journalist uncovers the horrific slaughter of 22,000 Polish officers during the Second World War. 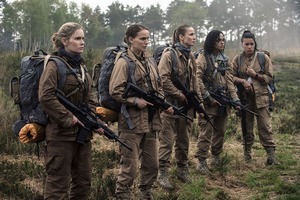 Annihilation (2018) Natalie Portman, Oscar Isaac, Jennifer Jason Leigh, Gina Rodriguez, Tessa Thompson, Tuva Novotny. A biologist signs up for a dangerous, secret expedition into a mysterious zone where the laws of nature don't apply. Formats: DVD, Blu-ray/DVD Combo, VOD, Digital. Blu-ray extras: Three-part featurette: Part 1 – Southern Reach: "Refractions": See how director Alex Garland created the tone, textures and color palettes for the various film environments on set; "For Those That Follow": the cast’s perspective on their roles and why they found the story so intriguing; Part 2 – Area X: "Shimmer": how filmmakers transformed real set locations to create the world of Annihilation; "Vanished into Havoc" mind-blowing stunts and special effects; Part 3 – To The Lighthouse: "Unfathomable Mind": why the visual effects are integral to achieving director Alex Garland’s overall vision for "Annihilation"; "The Last Phase": cast and crew share their fondest memories from filming Annihilation." (Paramount). Au hasard Balthazar (1966 -- France) A profound masterpiece from one of the most revered filmmakers in the history of cinema, "Au hasard Balthazar," directed by Robert Bresson, follows the donkey Balthazar as he is passed from owner to owner, some kind and some cruel but all with motivations outside of his understanding. Balthazar, whose life parallels that of his first keeper, Marie, is truly a beast of burden, suffering the sins of humankind. But despite his powerlessness, he accepts his fate nobly. Through Bresson’s unconventional approach to composition, sound, and narrative, this simple story becomes a moving parable about purity and transcendence. On DVD and Blu-ray, with new 2K digital restoration, with uncompressed monaural soundtrack on the Blu-ray. Extras: Interview from 2005 with film scholar Donald Richie; “Un metteur en ordre: Robert Bresson,” a 1966 French television program about the film, featuring Bresson, filmmakers Jean-Luc Godard and Louis Malle, and members of "Balthazar’s" cast and crew; original theatrical trailer; an essay by film scholar James Quandt. (The Criterion Collection). East West 101, Series 2 (2009 -- Australia) Two-disc set with seven episodes. Set around the Major Crime Squad in metropolitan Sydney, Australia, this thrilling series is based upon the experiences of actual detectives in a crime unit in Sydney’s western suburbs and deals with the clashes of culture, socio-economic statuses, and religious tension in Australia. This season features new perils for Detective Zane Malik, a Muslim Arab living in post-9/11 Australia. After a deadly car bomb goes off in a Sydney suburb, fear and suspicion thrive as the community blames it on Islamic extremists. However, Malik is not convinced it was a terrorist attack, and he joins a joint task force led by Agent Richard Skerritt. The investigation throws Malik into a high-stakes undercover mission targeting a suspected arms-dealer, but the job takes him away from his family and even threatens their safety. Formats: DVD. Extras: Behind-the-scenes featurette. (Acorn media). Frontline: Weinstein (2017) Harvey Weinstein was once one of the most successful producers in Hollywood. But beneath the glitz and glamour, there was a pattern of sexual misconduct going back to the very start of his career. This program investigates the disgraced mogul's spectacular downfall, the efforts to silence his accusers, and what Hollywood itself knew. Drawing on exclusive insider accounts, this program examines how Weinstein used lawyers and private detectives to help him suppress sexual harassment allegations. The film shines new light on what those around Weinstein knew about his behavior, and when. Formats: DVD. (PBS Distribution). 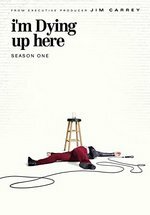 I'm Dying Up Here: Season One (2017) Three-disc set with all 10 episodes. Set in the celebrated and infamous L.A. stand-up comedy scene of the '70s, where the careers of most comedy superstars began, "I'm Dying Up Here" delves into the inspired and damaged psyches that inhabit the hilarious, but complex business of making an audience laugh. The series is based on William Knoedelseder's book of the same name. Before the internet and viral videos made it easy for aspiring comics to get their material seen, they had to travel and perform at comedy clubs to rise through the ranks of stand-up comedy and make a name for themselves. Oscar winner Melissa Leo leads the ensemble cast as Goldie, a comedy-club owner who mentors a competitive but close-knit group of comics. She leads her business with an iron fist but nurtures the comics with tough love because she knows that there's no such thing as an easy laugh in their chosen profession. Formats: DVD. (Showtime/CBS/Paramount). Midnight Cowboy (1969) One of the British New Wave’s most versatile directors, John Schlesinger came to New York in the late-1960s to make Midnight Cowboy, a picaresque story of friendship that captured a city in crisis and sparked a new era of Hollywood movies. Jon Voight delivers a career-making performance as Joe Buck, a wide-eyed hustler from Texas hoping to score big with wealthy city women; he finds a companion in Enrico “Ratso” Rizzo, an ailing swindler with a bum leg and a quixotic fantasy of escaping to Florida, played by Dustin Hoffman in a radical departure from his breakthrough in "The Graduate." A critical and commercial success despite controversy over what the MPAA termed its “homosexual frame of reference,” "Midnight Cowboy" became the first X-rated film to receive the best picture Oscar, and decades on, its influence still reverberates through cinema. On DVD and Blu-ray, with new 4K digital restoration, with uncompressed monaural soundtrack on the Blu-ray and an alternate 5.1 surround soundtrack, presented in DTS-HD Master Audio on the Blu-ray. Extras: Audio commentary from 1991 featuring director John Schlesinger and producer Jerome Hellman; new selected-scene commentary by cinematographer Adam Holender; "The Crowd Around the Cowboy," a 1969 short film made on location for "Midnight Cowboy"; "Waldo Salt: A Screenwriter’s Journey," an Academy Award–nominated documentary from 1990 by Eugene Corr and Robert Hillmann; two short 2004 documentaries on the making and release of "Midnight Cowboy"; interview with actor Jon Voight on "The David Frost Show" from 1970; interview from 2000 with Schlesinger for BAFTA Los Angeles; excerpts from the 2002 BAFTA LA Tribute to Schlesinger, featuring Voight and actor Dustin Hoffman; trailer; an essay by critic Mark Harris. (The Criterion Collection). Paws P.I. (2018) Jon Lovitz, Selah Atwood, Christian Brunetti. Dove Foundation approved family adventure. Peter Williams and his dog, Jackson (voice by Lovitz), are best friends and enjoy hanging out and skateboarding around town. But when Peter’s father Connor, a private investigator, is hired by veterinarian Katherine Worthington to help prove that her aunt’s will was stolen by her corrupt uncle, Peter, Jackson and a gaggle of animal friends decide to do some investigating of their own. Formats: DVD, VOD, Digital. (Lionsgate). 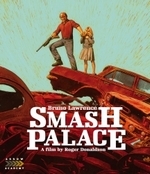 Smash Palace BLU-RAY DEBUT (1981 -- New Zealand) Premiering at the 1981 Cannes Film Festival, "Smash Palace" was Roger Donaldson's second feature following the success of "Sleeping Dogs," a film which had heralded the arrival of the New Zealand New Wave. "Smash Palace" concerns itself with the marriage of former racing driver Al (Bruno Lawrence) and French-born Jacqui (Anna Jemison). The pair had met when she nursed him back to health following a career-ending injury. They married, returned to Al's native New Zealand to take over his late father's wrecking yard business -- the Smash Palace of the title -- and had a child. But over time stagnation has set in, Jacqui's resentment of Al has grown, and things are threatening to spill over. Playing out as a darker, more haunting New Zealand variation on such US separation movies as "Kramer vs. Kramer" or "Shoot the Moon," "Smash Palace" offers a brilliant, vivid messy portrait of masculinity in crisis, driven by Lawrence's immense central performance -- once again confirming his status as one of New Zealand's finest actors. With original mono audio (uncompressed LPCM). Formats: Blu-ray. Extras: Commentary by writer-director Donaldson and stunt driver Steve Millen; "The Making of Smash Palace," a 51-minute documentary on the film’s production featuring interviews with Donaldson, actor Keith Aberdein, filmmaker Geoff Murphy and others; theatrical trailer; reversible sleeve featuring original and newly commissioned artwork by Sean Phillips; FIRST PRESSING ONLY: Illustrated collector’s booklet featuring new writing on the film by Ian Barr, a contemporary review by Pauline Kael and the original press book. (Arrow Video/MVD Entertainment). They Remain (2018) William Jackson Harper, Rebecca Henderson. Based on the 2010 short story, "-30-" by award-winning author Laird Barron, "They Remain" explores the evolving relationship between Keith and Jessica, two scientists who are employed by a vast, impersonal corporation to investigate an unspeakable horror that took place at the remote encampment of a mysterious cult. Working and living in a state-of-the-art, high tech environment that is completely at odds with their surroundings, they spend their days gathering physical evidence, analyzing it, and reporting on their findings. The intensity of their work, and their extreme isolation, bring the pair closer. But, when Jessica discovers a mysterious artifact of unknown origin, the dynamic between them changes: secrets are kept, sexual tensions arise, and paranoia sets in. Keith begins to have visions and is unable to distinguish whether they are nightmares or hauntings. Having lost all sense of what is real and what is imagined, all he knows is that the horror he and Jessica have been sent to uncover -- a horror that could be biological, psychological, or supernatural -- now threatens his very survival. Formats: Blu-ray, VOD, Digital. (Giant Interactive). The Two of Us (1967 -- France) A comically bittersweet tale, Oscar winner Claude Berri's film is also a poignant drama of identity and heritage. When an 8-year-old Jewish boy (Alain Cohen) living in Nazi-occupied France is sent by his parents to live in the country with the Catholic parents of their friends, he is faced with a culture clash both religious and generational. As the grandfatherly (and flagrantly anti-Semitic) Pepe (Michel Simon) infuses the role with a gruff tenderness, his growing relationship with the boy a touching portrayal of connection in a broken world. A beautiful new 4K restoration of the black-and-white world cinema classic, which was the debut of acclaimed director-producer Claude Berri ("Jean de Florette," "Manon of the Spring," "Tess," "The Lover"). Formats: DVD, Blu-ray, Digital. Extras: Audio commentary track by Wade Major, film critic with NPR affiliate KPCC-FM and co-host and producer of the IGN DigiGods podcast; the 2017 rerelease trailer; more. (Cohen Film Collection). Get the latest DVD release information (free) every Tuesday morning. Subscribe here.